Emma Carney was a fierce competitor and took triathlon to new levels of speed, power and athleticism. Her competitiveness took her to two world titles, three year-ending world number one rankings and nine Australian titles. 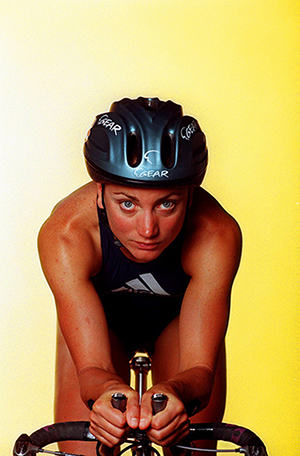 During the 1995, 1996 and 1997 seasons Carney won all but three races as she dominated the sport. Tomorrow night, Emma Carney will be honoured with induction into the Sport Australia Hall of Fame as an athlete member for the sport of triathlon. Expectation of success and the determination to achieve it were two dominant Emma Carney traits. That and a fear of what ‘not winning’ might hold. Exactly how fierce was that desire to win? It is best summarised by her own description of her first world title win in 1994, a race in which she was making her international debut. “I won by the largest margin ever, and in the entire lead up I was told it was impossible to win a world title in your first race at your first attempt,” Carney recalled. “To prove everyone wrong, and shock the world of triathlon was very satisfying,” Carney said reflecting on the moment she arrived on the international scene in the most barnstorming fashion. It sums up her approach to a sport she dominated in the late nineties. That win, at the ITU Triathlon World Championships in Wellington, New Zealand, was just the beginning of a trailblazing triathlon career that was renowned for her explosive bike and run combination which enabled her to dominate her competition. She raced her first triathlon in 1993, a year later she won that first world title and off the back of three totally dominant seasons, Carney lined up on the streets of Perth against two fierce rivals, both Australians - the late Jackie Gallagher and 2014 Sport Australia Hall of Fame inductee Michellie Jones. “I think most fondly of my first world championship win in Wellington, at my first international race and my debut on the Australian triathlon team,” Carney said. “Perth was a great race, with me winning, Jackie G second and Michellie third. I expected it though,” Carney added, more in a reflection of how dominant she was at the time, than of an athlete dismissive of her rivals. She began her sporting career in athletics and was one of Australia’s leading young athletes. As a talented junior distance runner, Carney won national school titles on the track and represented Australia in two world cross country championships and two Australian road relay teams at senior level before moving to the relatively new sport of triathlon. Much of this athletic prowess was thought to be due to her abnormally low resting heart rate (recorded to be below 30 at the AIS during altitude testing and training studies) combined with her extremely high lactate tolerance threshold. It was thought perhaps Carney was able to race at her maximum heart rate, with little to no lactate build up allowing her to maintain speed, whilst opponents struggled in the concluding stages of races. She was following in the already successful footsteps of the only other Sport Australia Hall of Fame members from triathlon - Jones and Greg Welch. “Triathlon is a sport with a much shorter history than many traditional sports in Australia. It was through the extraordinary racing results of Greg Welch and Michellie Jones that set the scene for a very dominant Australian triathlon team through the 90’s,” Carney said. Carney was forced to retire in 2004, when diagnosed with a serious heart condition which precluded her from competing any longer at the elite level. She had raced with an undiagnosed heart condition for a number of years and still remained competitive internationally. She was initially told by doctors she ‘would never exercise again’, and was fitted with a defibrillator. Despite this, Carney enjoys a healthy lifestyle and continues with her current pursuits in coaching and mentoring athletes of all abilities. “My induction into the SAHOF is an absolute honour,” Carney said. Emma Carney will be inducted to the Sport Australia Hall of Fame on Australian sport’s night of nights this Thursday 13th October – the sold out 32nd Sport Australia Hall of Fame Induction and Awards Gala Dinner, held at Palladium at Crown, Melbourne – presented by Etihad Airways.